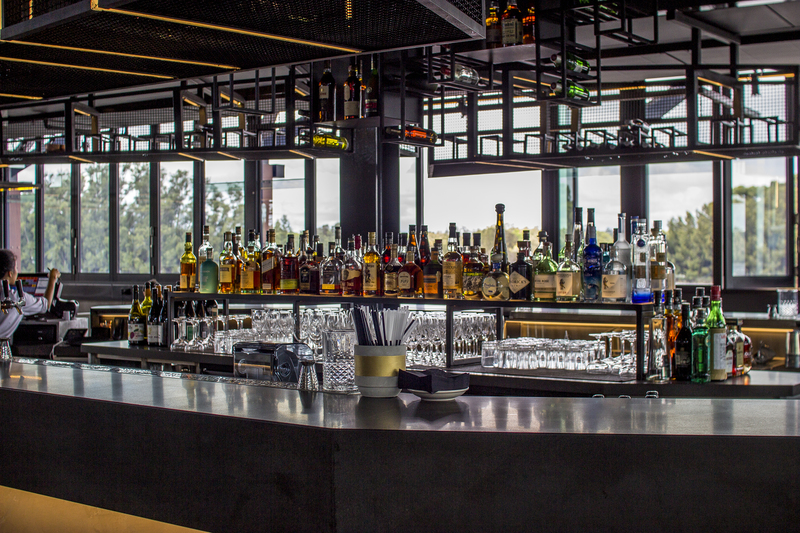 After carving a longstanding history as one of the most popular joints in Bali, it was no surprise that Ku De Ta would demand headlines for it’s recent opening in Perth. Located at Point Fraser, which brings a pricey parking fee for those who commute with their own vehicles, it boasts a beautiful river view and three different dining destinations all in one. Former Print Hall chefs, Daniel Fisher and Liam Atkinson are in charge of all things food for Ku De Ta. 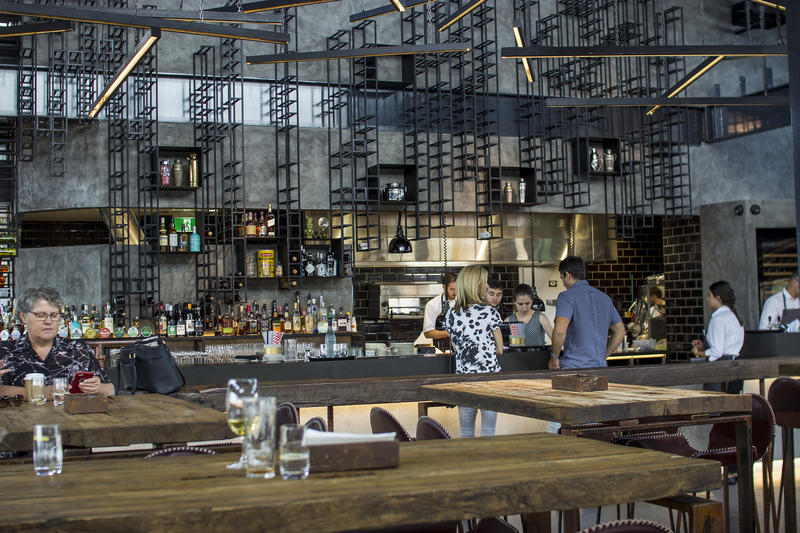 And their pedigree shows with a vast variety of influences demonstrated within each dining section. 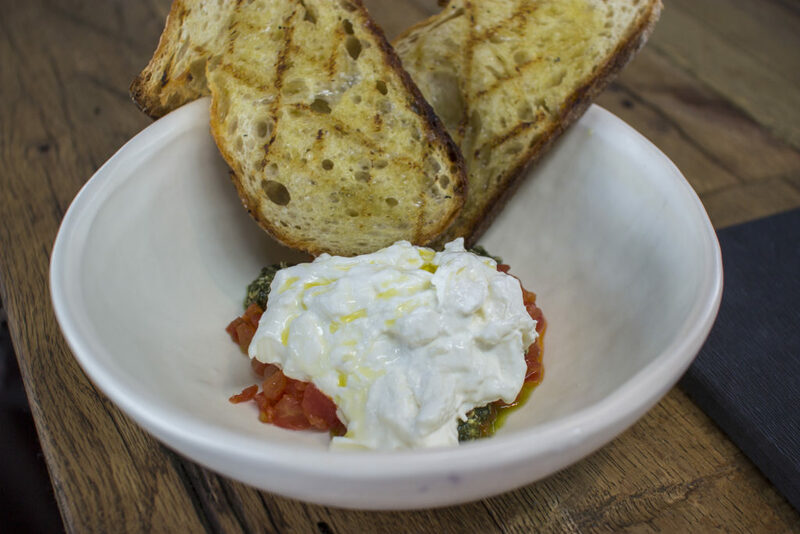 The first to open, the Deck, is a simple and affordable Italian homage with pizzas, pastas and entrees that inspire guests to kick back and enjoy the comfortable surroundings – with a beverage in hand of course. West, a seafood and charcuterie bar was next to follow, and Ku Dining being the last to open its doors. 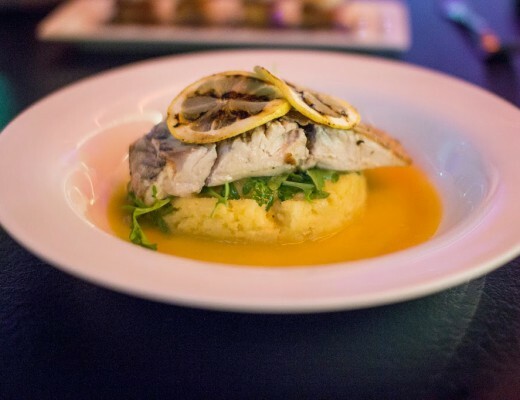 It’s a fine dining offering that highlights local ingredients in what is reported to be an enviable manner. I’m looking forward to trying the latter two, but on my first visit there it was a beeline to the Deck with my partner Jeremy for a lazy lunch before I was due to fly out to Taipei a couple of days later. 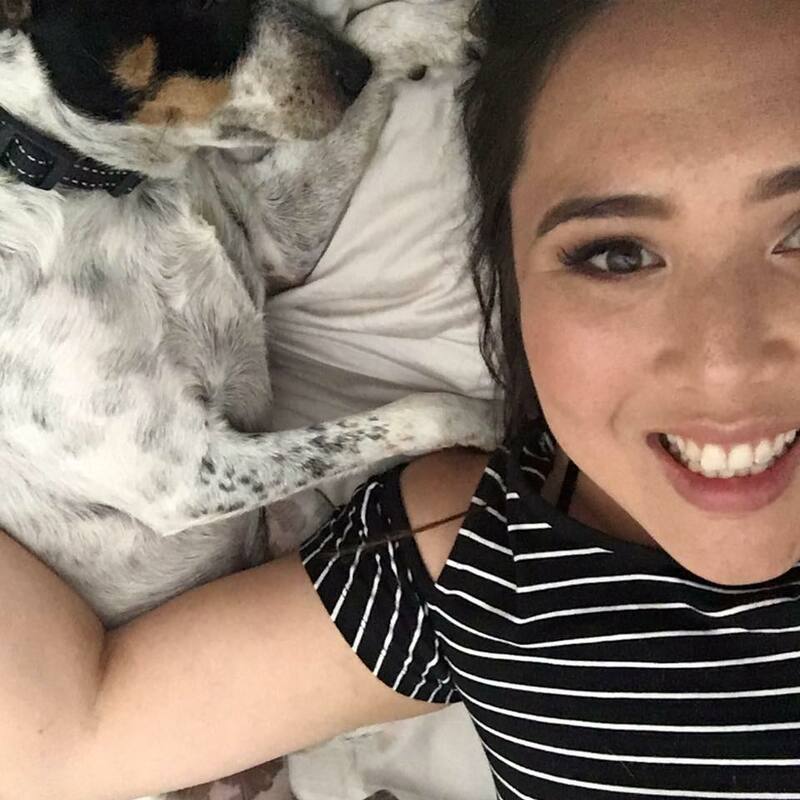 Holidaying without him was actually something I was dreading a little – even though we live together we don’t get the most time together so two weeks sans one another was going to drag out. But a return to see my grandparents was something I needed (and wanted) desperately to do, and I was excited to get back to my roots which I often feel a bit of a disconnect from. Settling in to our high stool chairs at Ku De Ta I was taken aback by the expansiveness of the venue. It’s huge! And I think that seeing it so busy on a Tuesday afternoon already showed that it will quickly become a popular destination of choice for meals or just drinks with a view. Service was a little slow, though friendly. I did think there was too long a gap between our entree and mains, which was surprising given it was less than half full with patrons, and many of them were just enjoying drinks. The menu was broken in to a few dishes from each section – starters, pizza, pasta and dessert. Knowing we are both pasta fiends, we decided to keep things simple and order one dish to share as an entree. Choosing was easy as soon as we both eyed the stracciatella ($18.00) – artisan cheese with tomato and pesto. For us both, this was our favourite dish of our lunch at Ku De Ta. 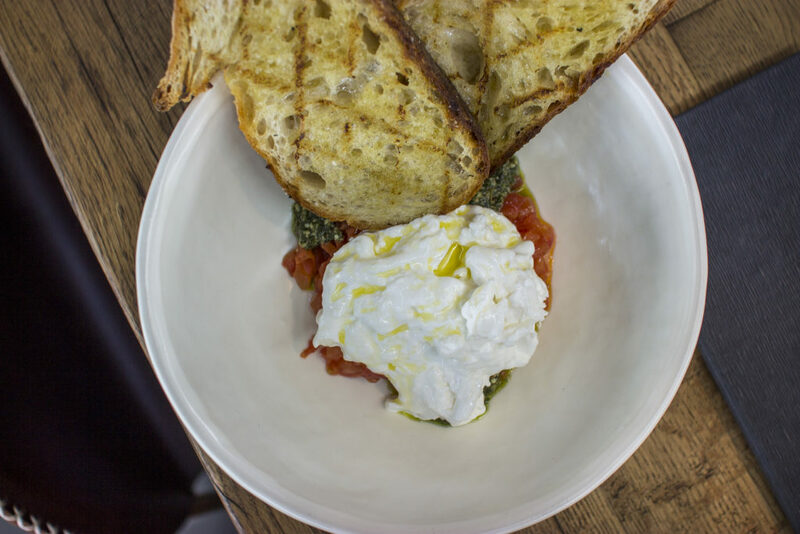 The stracciatella was so creamy and melted in our mouths. The tomatoes were sweet, punchy and fragrant. I thought the pesto was an excellent addition, providing a herbaceous quality which cut through the other ingredients and lifted each bite. The accompanying bread was warm to the touch. Excellent stuff. 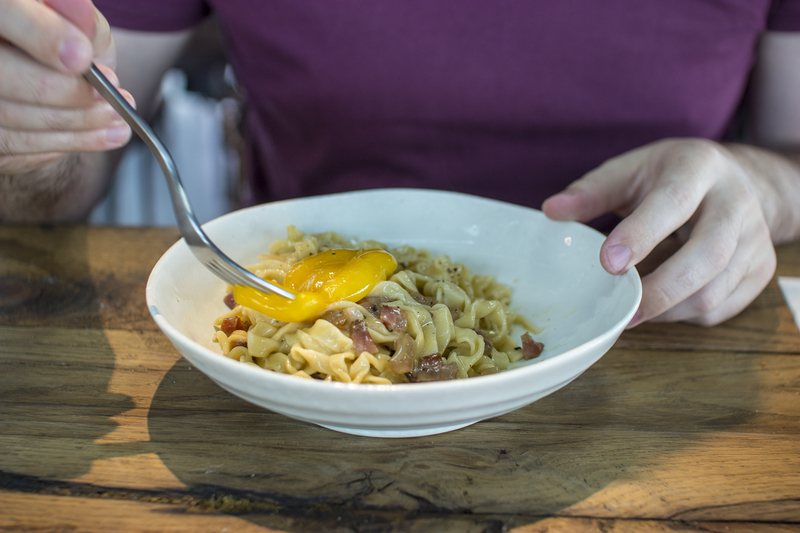 For his main, Jeremy chose the wholemeal bigoli carbonara with pork and duck egg ($25.00). I was glad he picked this because if he hadn’t, I definitely would have. 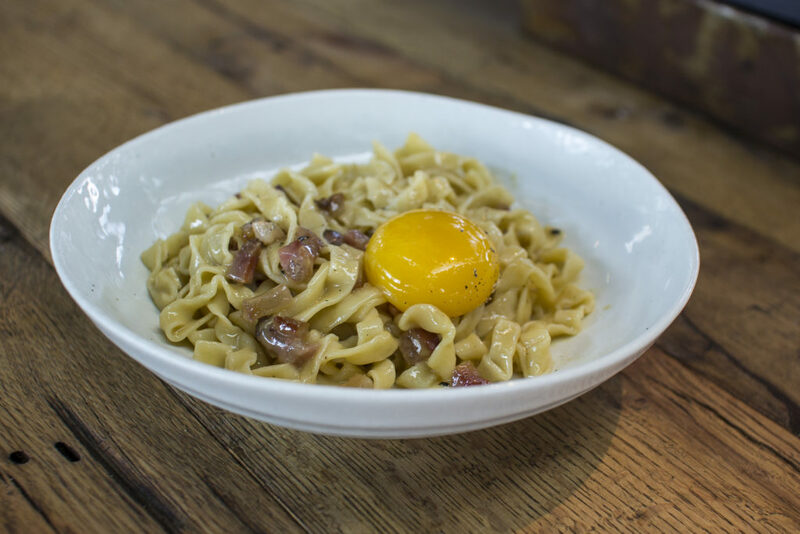 And with good reason… cos, carbonara. Here’s a secret though: Jeremy makes a mean carbonara. It’s heavenly. 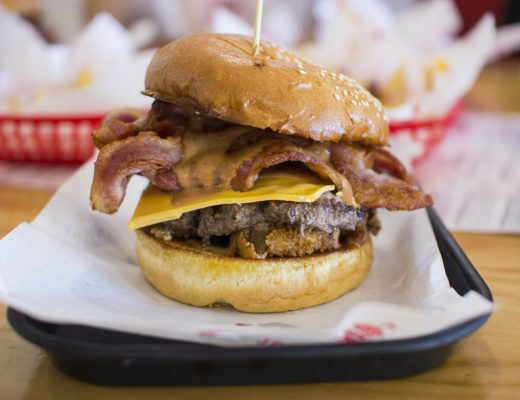 He fries off super finely sliced strips of fatty pancetta, garlic and swirls the noodles around to pick up all that pork grease. Then in goes the sauce of eggs, extra yolks and parmesan (no cream thanks) with salt and pepper. It’s a heart attack in a pan – and also one of the best things he cooks. 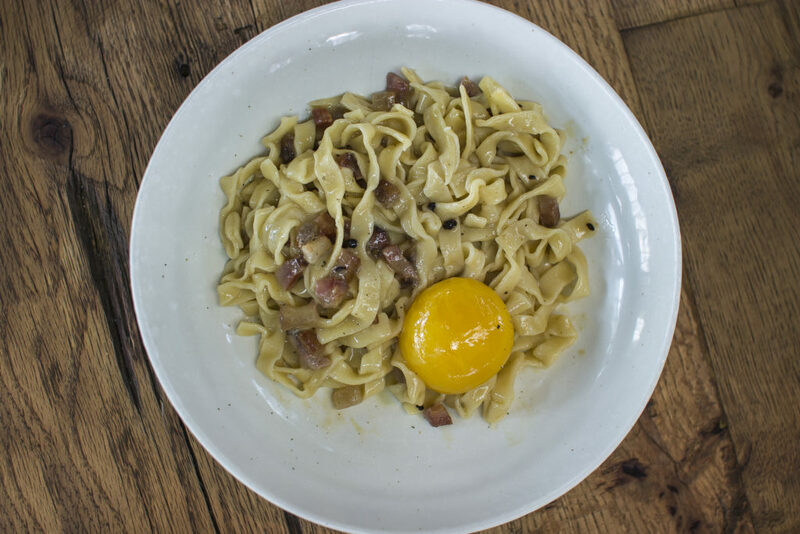 We’re not fancy chefs by any means but we can’t help but compare other carbonara dishes we try to this (or for an even more ambitious benchmark – Lulu La Delizia’s version which is incredible). And while there’s no right or wrong answer between the use of cream or not, we sit in the latter camp. Sadly this meant that Ku De Ta’s version was already on the back foot. The use of the thicker cut strips of pork was welcome (when isn’t pork welcome though), and provided nice chunky salt injections. However it didn’t quite impart into the pasta beyond it’s presence itself. 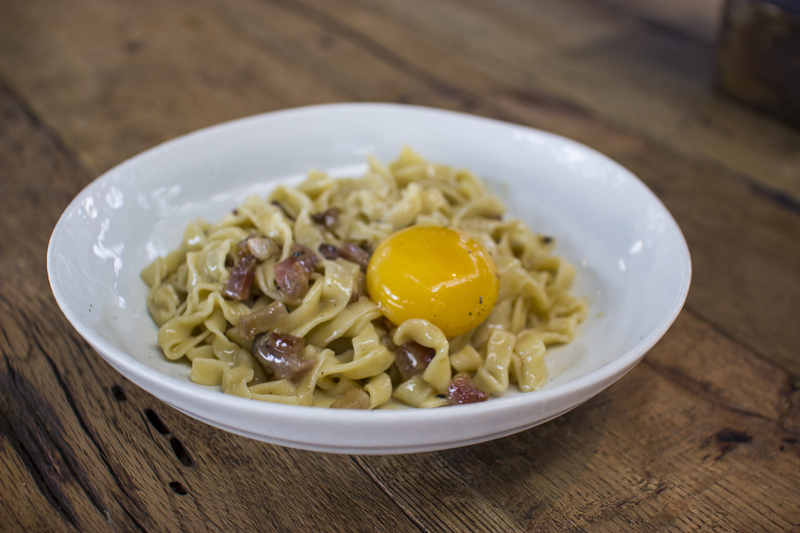 And the duck yolk, was satisfyingly rich but needed some parmesan to mingle in to get that real saucy quality. The pasta itself was cooked pleasingly al dente. Bitey and textural. But bigoli as we know it, it was not. Usually it comes in the form of a long tube, which this was a flat ribbon similar to fettucini. Tasty – yes. Accurate to it’s description – no. At least not to my understanding, but I’d never profess to be a pasta expert (pasta eater is another thing altogether) so maybe I’m wrong. The dish as a whole was a bit hit and miss. Great potential, but it didn’t quite sing the highs of flavour we wanted it to. 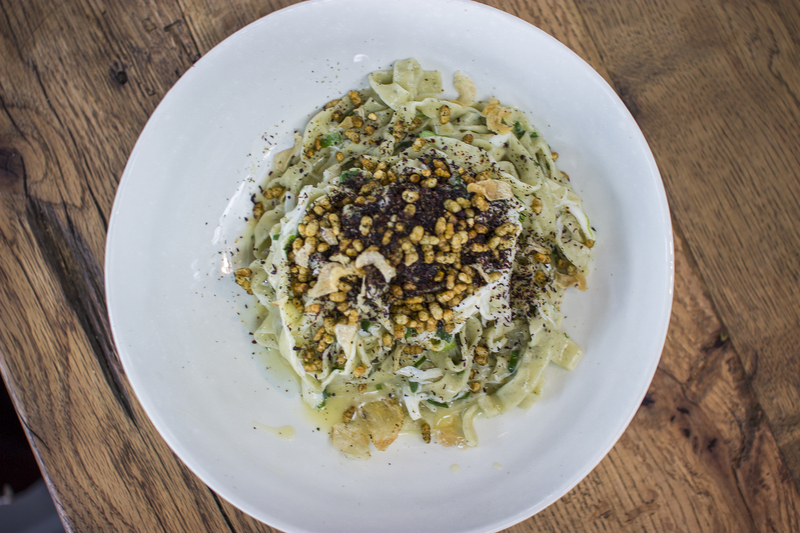 Though the goats cheese agnolotti was calling my name, I decided to steer clear of a second cheese dish and opted for the crab spaghetti with seaweed, toasted garlic and furikake ($25.00). It had a distinctly Japanese sound to it’s description and suffice to say my curiosity was piqued. Would this fusion be a success or a failure as many fusion dishes often are? 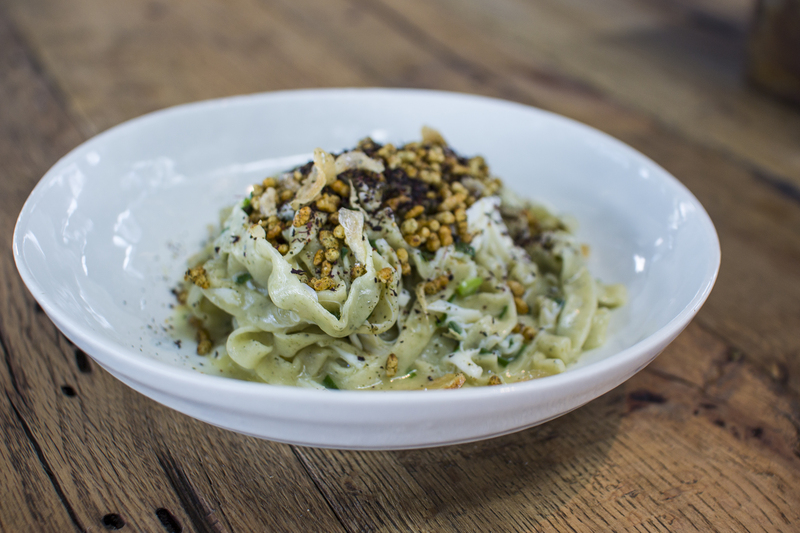 Similar to Jeremy’s dish, the pasta was more of a fettucini that spaghetti. The cooking of the noodles was spot on though, and I liked that it managed to scoop up the sauce that pooled at the bottom with ease. I do think a finer cut to the pasta would have served this dish better though. The toppings themselves… well first off, big tick as to how much crab there was throughout. However some pieces were shredded a bit too finely, meaning they got lost but the bigger pieces were sweet and oh so delicate. Crab really is one of my favourite things to eat! The toasted garlic was delicious but overpowered the crab a bit – and it definitely left a lingering quality to each bite. 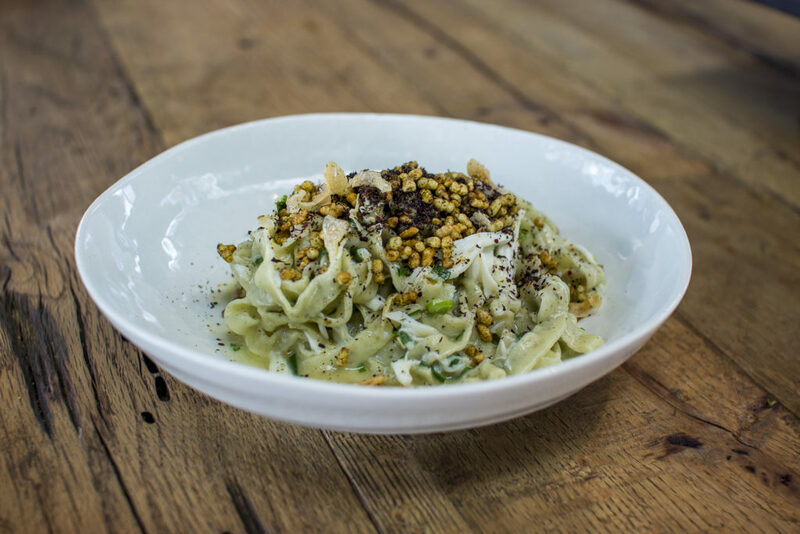 The furikake, seaweed and puffed rice brought the Japanese elements home and turned this into an ode to the sea. I have to admit, it did take my head about a quarter of the dish to really wrap itself around what I was devouring. Was it enjoyable? I think so. Sometimes I liked what I was eating, others I regretted not ordering the agnolotti. Would I order this again? I don’t think so. It has merits sure: great technique and great flavours – but there was something a little polarising that I can’t quite put my tongue on. Maybe it’s a personal preference thing? I’m not sure. Now while I would normally happily chow down on dessert to finish off a meal at a new venue, in this instance Jeremy and I felt like we were sufficiently full after our lunch. So we bid Ku De Ta adieu, savouring the memory of that impressive stracciatella which we both agreed we order again in a heartbeat. Next up on my hit list: West and Ku Dining.